Back to reality from the West Indes we head for the Lake District. 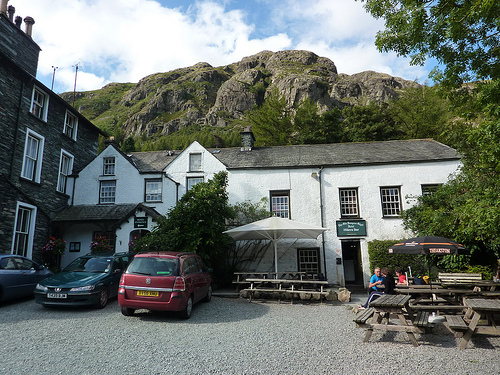 We’ve stayed in many places over the years but they’ve all tended to be on the more comfortable end of the spectrum – think the Drunken Duck, for example. Or Holbeck Ghyll in its heyday, before the slide from grace. 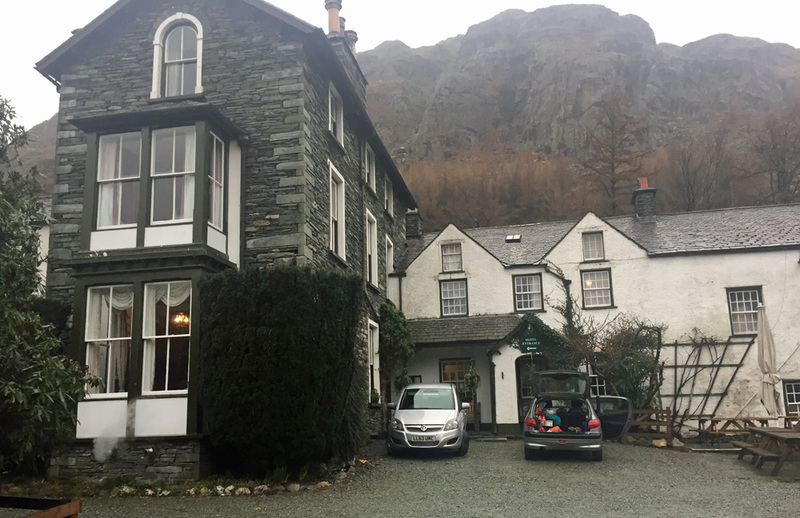 We’re meeting old friends for a 60th birthday celebration and, with assorted children, take over a good chunk of the Old Dungeon Ghyll. 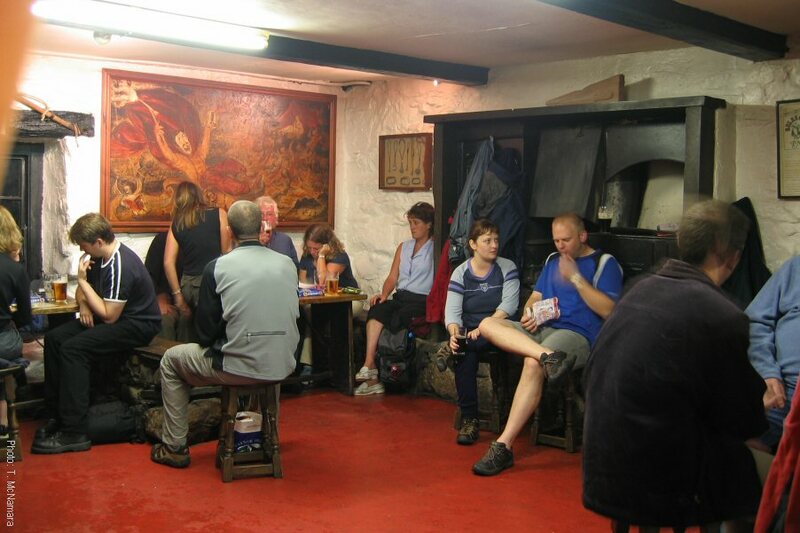 The ODG is an institution, beloved of many generations of walkers in the Lakes. It’s owned by the National Trust but run, since 1983, by Neil and Jane Walmsley. It’s definitely at the comfortable end, though could never be described as smart; there’s no danger of Michelin inspectors beating a path to its door – and it’s none the worse for that. 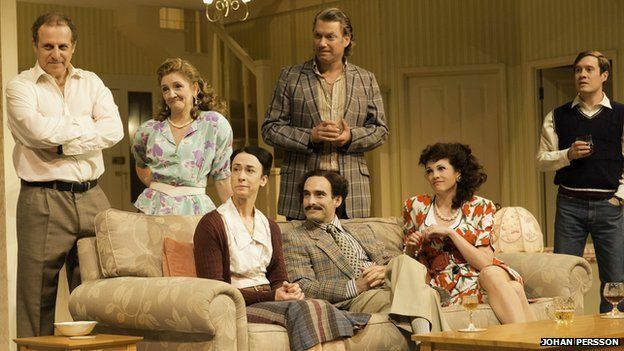 There’s a big comfortable lounge, roaring fire and the sort of the armchairs and sofas that you might find on an Alan Ayckbourn set. Someone loved them once, and you can just sink in and lie back, having dried out from the torrential rain. 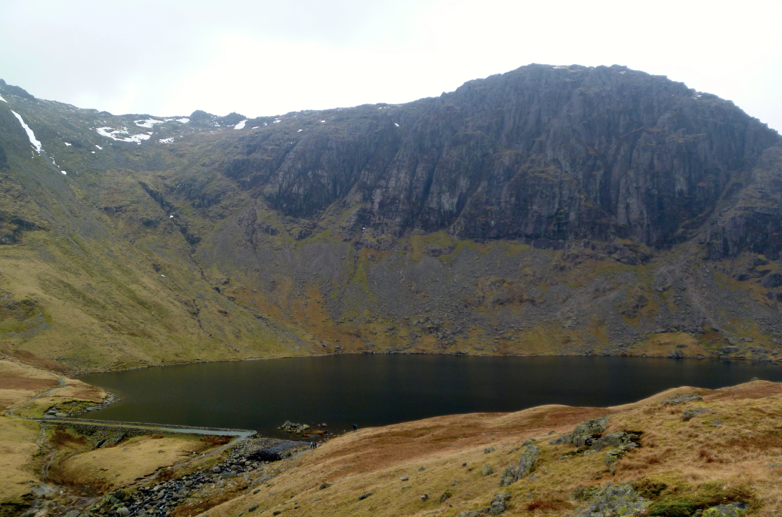 Yes, they have weather here – Friday was good as we enjoyed a short afternoon climb up to Stickle tarn, but Saturday… The Team walk meant wading through flooded footpaths, flooded roads, flooded fields and crossing flooded rivers. The small dishevelled group balancing kayaks on their heads probably had a very rapid trip down stream; unless they were just having fun in what used to be a field before it became a lake. Breakfasts are hearty – all the usual choices – and dinners wholesome and filling. One brave soul had a go at a pudding, but was defeated. Excellent range of ever changing local [and not so local] beers; the range even included Old Peculier from Theakstons. We haven’t had any of that for at least thirty years. Comfortable bedrooms, with glass thin enough to announce the rain and save you reading the weather forecast; some of then even have en-suite facilities these days. Whatever next. 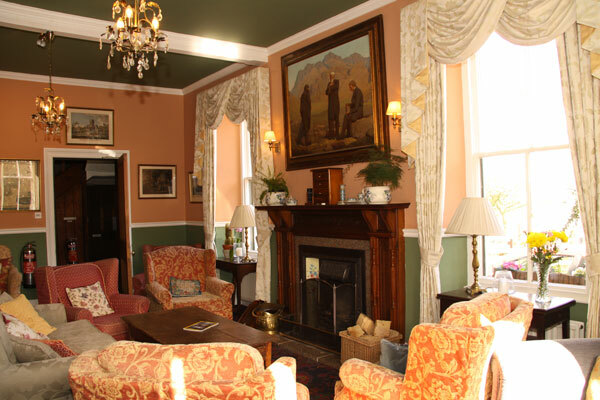 Of course, as well as the dining room and residents’ bar, there is the Hikers’ Bar. World famous. You can’t book a table in there and when the weather’s not too good [what?] you have to be in early for your place near the fire. Similarly excellent beer and the same food menu. 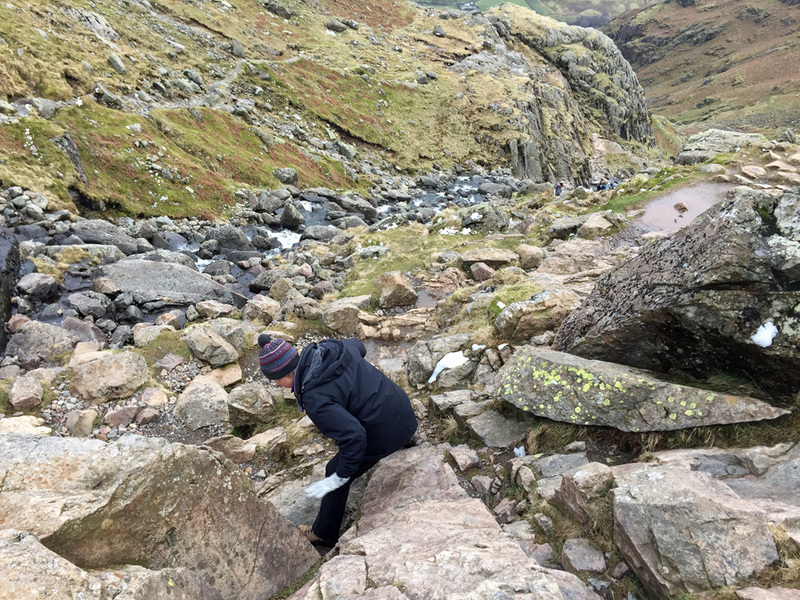 …and the way back down.